Superlatives are in. 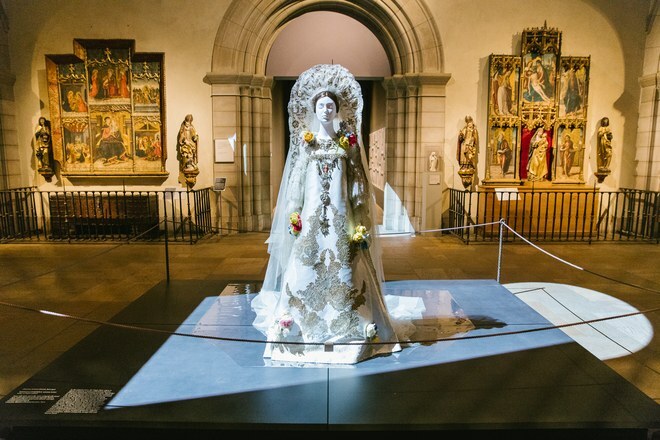 Last week, the Metropolitan Museum of Art issued a press release saying it had welcomed its one-millionth visitor to its special Costume Institute exhibition, Heavenly Bodies: Fashion and the Catholic Imagination–proclaiming it, weeks before the show closes, “the Costume Institute’s most attended show ever and The Met’s third overall most attended” exhibit. Really? Truth is, we can’t be sure of that. Because of the complex installation, which inserted costumes into the permanent collection galleries of Byzantine Art, Medieval Art (below right), parts of the Lehman wing (left) and the Cloisters, actual numbers are nearly impossible to compute. How can the Met tell if someone who walks through the Byzantine corridors is merely on his or her way to the American wing, say, and perhaps just glancing–or not even that–at the costumes above? Also, with the exhibit spread out in three locations–there’s also the Costume Institute galleries on the Met’s lower floor–how can the museum ensure that it’s not double- or triple-counting people? This three-part exhibition required that our Research Department develop a formula to measure visitor levels through several means. But that’s all the museum would reveal officially. As I understand it, though, the museum is counting people at locations in the exhibit that are not passages to other places (which is pretty hard on the main floor of 1000 Fifth Ave.), using visitor surveys at the Cloisters and the Costume Institute galleries to make sure people are not double-counted, and analyzing these numbers in the context of overall attendance. Voila–one million. last Thursday. The Met thinks this number is not only valid but also conservative. It may be–but as an exact number it lacks a certain credulity. Museums get into the “largest,” “biggest,” “most” syndrome for a mix of reasons, and marketing is one of them–with museums these days competing with so many other activities, it’s easier to get attention with superlatives. For parts of the public, the use of superlatives also stoke “the fear of missing out.” And therefore they get visitors to come. That claim is also problematic. How is the Met counting the gallery space? All of the Byzantine galleries? All of the Medieval court? Tell us, please–when you write the press release. (And, to cite another recent example at the Met, the press release for the Michelangelo exhibit noted that it “will bring together the largest group of original drawings by Michelangelo ever assembled for public display”). I measure exhibition success by numbers, too–because I like others are interested in getting more people into museums to look at art. But always there’s a part of me that says to treat the numbers with caution. Unless special exhibitions are entirely ticketed–and most are not, given that members sometimes pass in with their membership cards, to cite one issue–attendance numbers have to be taken with a grain of salt. Also, as Heavenly Bodies demonstrates, there’s no consistency across museums in counting–it’s not using that formula for other special exhibitions. Nearly every sizable museum looks at weekly [attendance] figures. Some, from big institutions like the Metropolitan to smaller ones like the Portland Museum of Art in Oregon, track the numbers daily. Many keep a running year-to-date count. The daily report of the Metropolitan, which considers itself the most sophisticated people counter among museums, includes the day’s weather and the weather of a year before, to gauge the outside competition. It also tracks the effects of media coverage, advertising and other variables, which it declines to disclose. Heavenly Bodies remains on view until Oct. 8–which will undoubtedly boost its numbers and possibly its ranking in the Met’s league table. The last major costume show there, China: Through the Looking Glass, attracted 815,992 visitors, but it was on view only from May 7, 2015 to September 7, 2015. And that was an extension from the original plan–three weeks were added to the end of its very popular run. 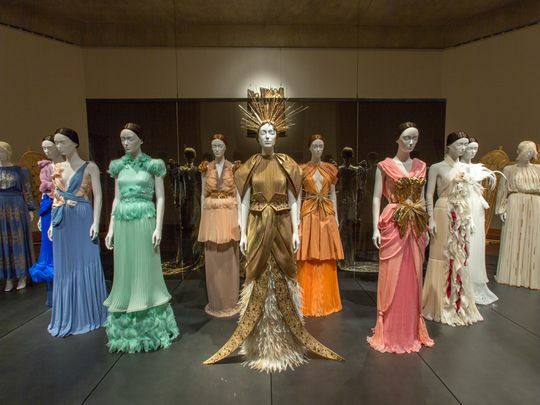 Each time the Costume Institute edges up in those statistics, it gains more ammunition for taking over other parts of the museum, which it has been doing for a number of years now. And that is not, in my view, a happy thing. Totally agree! I hope they didn’t count me among that million because I definitely did not go there to see that exhibition. It was impossible to get anywhere else in the museum without going through it. I for one, have walked through the large medieval exhibition hall (designated as Gallery 305), where the bulk of the exhibition has been installed, several times, each time being appalled at the tasteless content and portentous music, trying to escape as soon as possible to something else (even it was the adjoining Museum Shop). This is an exhibit inappropriate for the Met. I hope I was not counted as a visitor to the exhibition.